a bike running on water, easy to ride and safe. Our Bikeboat Up is perfect for all those who want to practice a recreational or competitive activity. The Water Bike (also called floating boat or bike-boat) is a real bike having a lightweight frame that allows to reach high performance, mounted on two floats and able to “cycle” on water. Safe and easy to assemble/disassemble, water bikes are supplied with a special kit. The ease of assembly and disassembly allows you to transport the kit in your car boot, without causing excessive clutter, as you can then assemble the bike directly on site. Rent or buy your waterbike from Water Bike Italia based in Laglio, on Lake Como. Exercising in the open air has always been healthy and an excellent opportunity to enjoy nature while having fun. Water sports have increased exponentially in recent years and new sports have been added to activities such as surfing, boat racing and water skiing, which have been practiced for some time. These sports include kitesurfing, wakeboarding and the dragonboat, canoe polo and bikesurfing, which are becoming increasingly popular. Amusement, ease of cycling, less difficulty and suitable for everyone; these are the fundamental characteristics that make Water Bike a success. The Water Bike is a real lightweight bike (it weighs 48.5 Ibs in total, including its accessories) mounted on floats which ensures safety and stability thanks to its catamaran trim, using a compact and efficient propulsion system for cycling. With little effort, the water bike can reach speeds of up to 10-12 km/h. Furthermore, the bike surfing is within everybody’s reach: Cycling is highly safe thanks to the specific configuration of the bike and the meticulous instructions provided by Water Bike Italia. 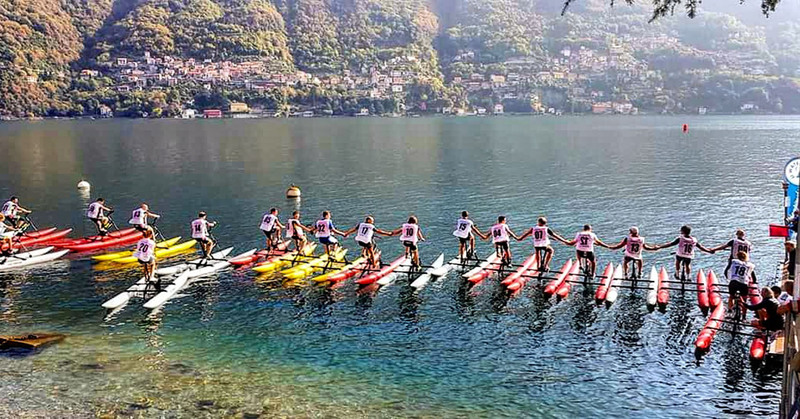 The water bike can be rented by private individuals, groups or managers of charter activities at the sea, lake and other water places suitable for bikesurfing activities from Water BikeItalia, official dealer of Floating Bike Chillboats, based in Laglio, on Lake Como. Water Bike Italia is a company specifically created to be a reference point for rental and sale of water bikes in Italy: therefore, it turns to private individuals, traders and professionals. Contact us to find out which are the nearest water bike rental points or come to rent them from Water Bike Italy, in Laglio on Lake Como. The bike is delivered disassembled with a detailed instruction manual that allows you to assemble it quickly and easily. You can choose to purchase or rent a floating bike, considering that special rates are in force for families and traders who want to offer tourists and swimmers exciting activities to entertain, have fun and do water sports. A reference point in Italy where you can rent and buy water bikes. Make a minimum investment with multiple benefits and have the safety of a proven product. Do you want to rent a Water Bike?